Plot: Silence a creature, then deal 1 damage to it. 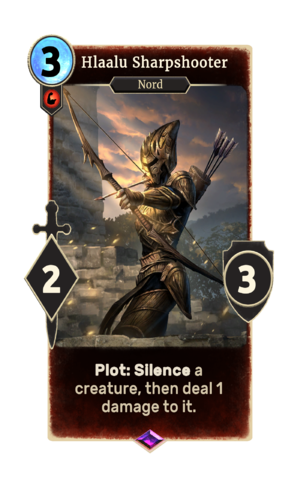 Hlaalu Sharpshooter is an epic Strength creature card. It is part of the Houses of Morrowind expansion. "I only need one shot." This card's plot ability applies the Targeted card effect. This page was last modified on 2 March 2019, at 00:06.